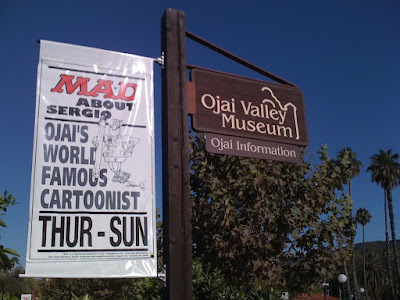 This past weekend, my family and I had the privilege to attend a special reception for "Mad about Sergio," a gallery exhibition for celebrated, award-winning Mad cartoonist Sergio Aragones, at the Ojai Valley Museum. (I'm also proud to count myself as a professional acquaintance of the artist!) 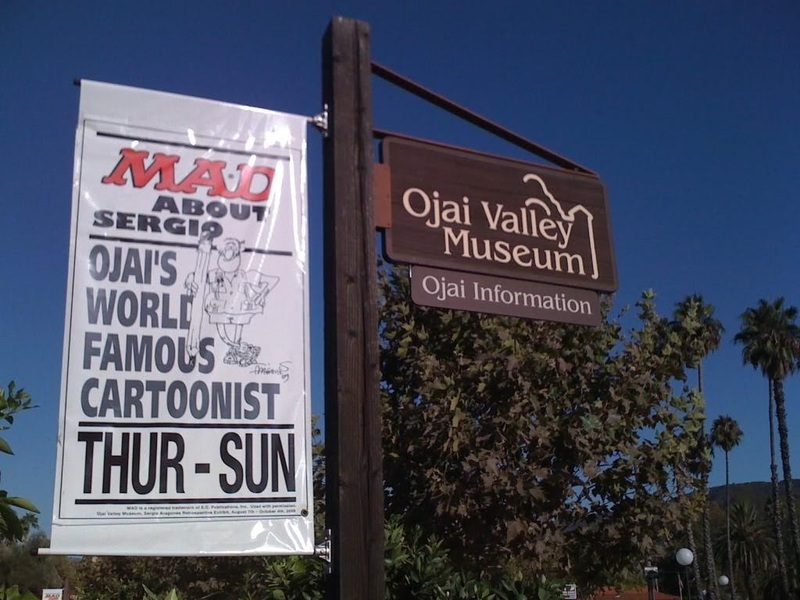 In attendance at the reception was the artist himself, Sergio Aragones, as well as a lot of his good friends from the cartooning world, including "Cathy" comic strip creator Cathy Guisewite, The Simpsons' creator Matt Groening, "Momma" cartoonist Mell Lazarus, and Usugai Yojimbo comic-book creator Stan Sakai. Though the show ends this week, if you have a chance to catch it before it closes, by all means do so. 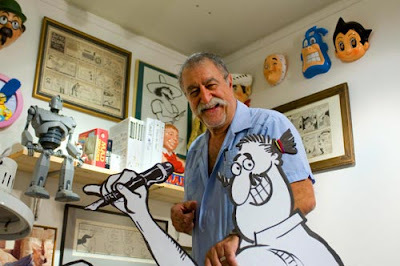 The exhibit provides a comprehensive retrospective of Aragones' work and career. Plenty of the artist's original art are included in the show—quite a few are surprisingly large in size, and impressive in their scope and the tiny details for which the fast-drawing cartoonist is known. Samples of some of Aragones' other arts and crafts interests—among them needlework—are also included, which the artist notes helps keeps his creative juices flowing. 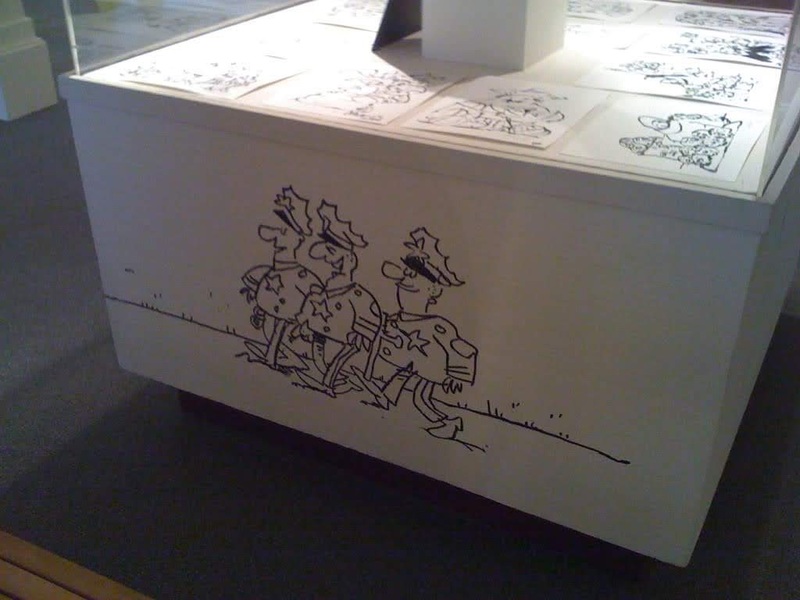 Pieces from his personal collection of original art by other cartoonists Aragones admires are also in the exhibition. 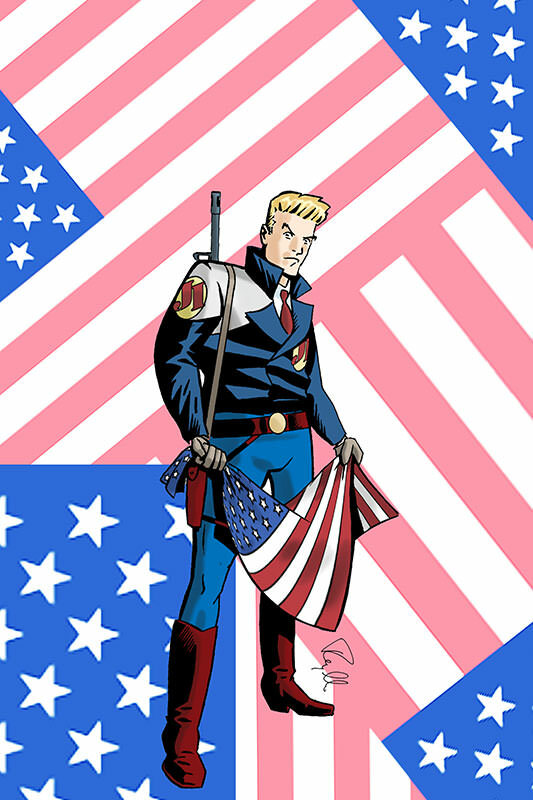 This includes work by Captain Marvel artist C.C. Beck and original comic strip art of classic work like Winnie Winkle and The Captain and the Kids. Many of Aragones' awards are also in the exhibition, as well as a delightful short documentary about the mounting of the show. 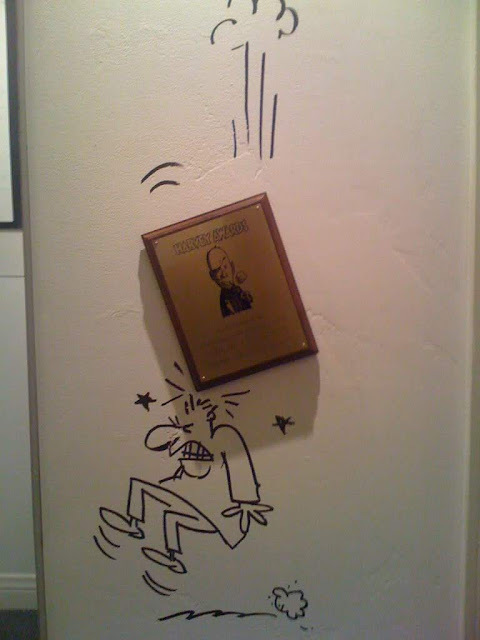 And in keeping with the cartoonist's sense of fun, many samples of Aragones' spontaneous cartoons can be found directly on the walls of the gallery itself, often interacting with the display pieces. 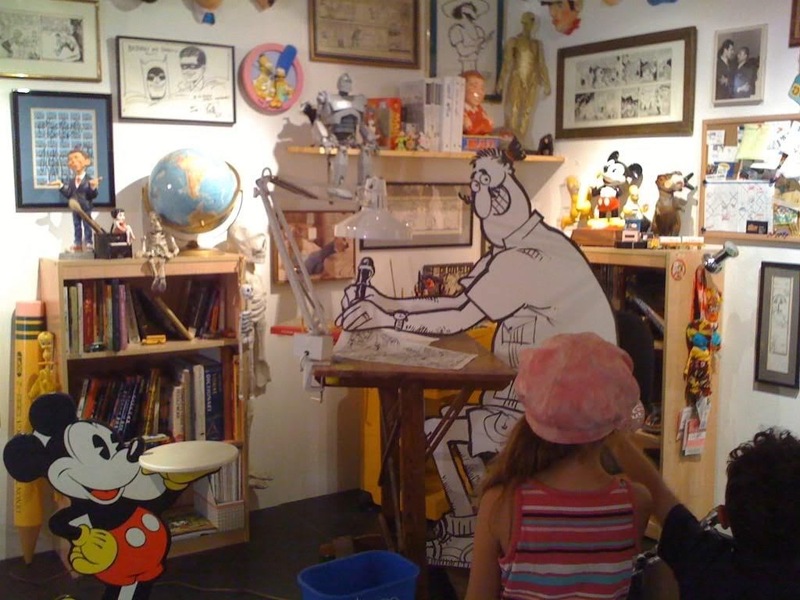 A re-creation of the artist's work space is on display at the show as well, as seen below. The show was mounted in conjunction with a series of talks and presentations by the artist. 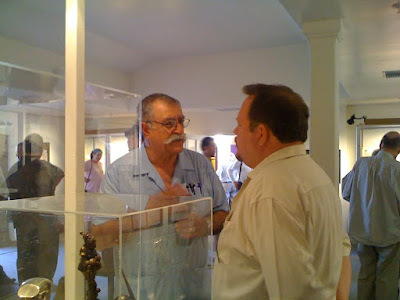 It was a delightful evening and a lot of fun to visit the show with the artist in attendance. 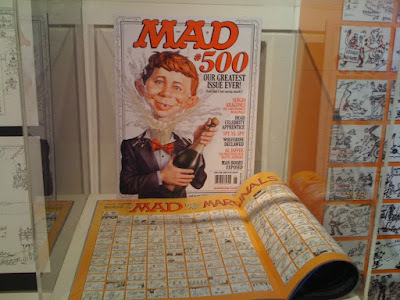 That really is a wonderful exhibit. It was good seeing you there.